In the first article we looked at the wonderful world of dog collars and restraining devices. In this article we review basic dog training, and the condition of gates and yard enclosures to ensuring your dog stays safe. Many people rescue or buy a dog and end up not having time to train them properly. A rescue dog can often come with considerable baggage, and you will never know what is going to set them off into an anxiety/ phobia or aggression. If you buy a dog and never socialise them, they will also build a lot of baggage. While many owners originally get a dog that their family agrees to walk, when the weather changes or their friends call, the dog is the last thing on the list to keep a commitment to. While recall, and a good level of socialisation is required for any pro dog walker to consider taking a dog into their pack, having sit and stay commands are an absolute bonus. HOWEVER one major and obvious thing that many owners don’t do is teach their dogs to walk properly on lead. A dog (most dog training places will agree in Australia) should walk calmly on the left side of you with loose lead). They should walk equally with you or slightly behind you. They should NEVER be pulling like a bull or attack dog, then drag you down the street. Sure that is often how puppies start out, but a dog walker is not being paid a dog trainer wage (high) and should not be expected to put their own safety and the dogs safety at risk getting that dog to the car. It might be the most loveable social dog on earth and play nicely with other dogs, but if its a massive puller on lead, this creates danger and frustration EVERY time the dog is put on lead to take them safely to and from the residence and the dog walker vehicle. So please consider the safety of your dog and future dog walkers, by at least getting a good leave of recall and easy walking ability of your dog. 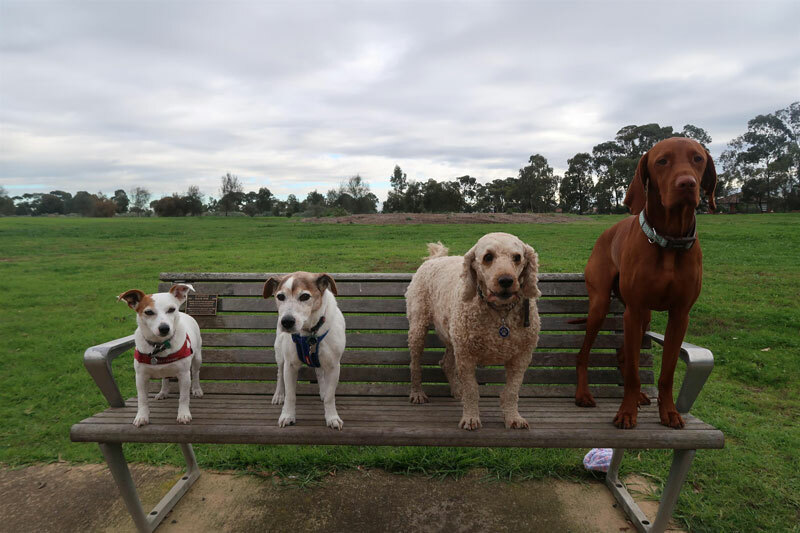 BTW there are many volunteer dog training organisations near most capitals cities in Australia that can really help for very little money with these important tasks. This is one of the biggest risks around homes for dogs. Not only from burglars but from letting your over excited dog escape. We are not talking just about gates not going all the way to the ground to stop dogs wedging through, but loose palings, or catches that don’t close properly. Another favourite hate of mine is the ‘two swing gates’ method, that don’t secure to the ground properly so all of the pressure is on a flimsy catch in the centre. Whether your gate is made of wood or steel, please make sure it is maintained in pristine condition, because if you have a regular dog walker walk your dog, that gate is suddenly going to get opened more times than it may have been in its entire life. If its flimsy to begin with, its ability to remain safe for opening and keeping your dog in is likely to diminish very quickly with repeated use. As a simple test, get someone who doesn’t regularly have to open that gate to see how easily they can safely do so. Can they lock it so it definitely is staying closed? You would be a amazed at how many side gates are 20 or more years old and have bad hinges, weak main structure and bad locking mechanisms – assuming that you can get to the gate open in the first place. You would think that it would be very easy to maintain a garden so that people and dogs don’t get hurt, but many people only prune what they have to, and don’t prune where they don’t normally walk. If you have roses, or citrus trees, spiky plants, that have big thorns on them, make sure that they are well away from any paths that lead to where a dog walker needs to pick your dog up from.